2019 Shae Keane Peacebuilder Award: Keyana J. Miller Most Improved Student Organization of 2019: Christian Pharmacists Fellowship International at ETSU Christian Pharmacists Fellowship International (CPFI) is a worldwide ministry of individuals working in all areas of pharmaceutical service and practice. Our Mission is to: •	Provide fellowship among like-minded professionals, •	Challenge and promote spiritual growth, •	Encourage the advancement of knowledge and ethics in the practice of pharmacy, •	Encourage evangelism and the integration of faith into practice, and •	Provide support and opportunity for service in both home and foreign missions. The One to Watch! 2019: ABLE Organization The purpose of the ABLE Organization shall be to advocate for, educate about, and celebrate individuals with disabilities. We will promote awareness of disabilities on campus, fundraise for local charities that benefit individuals with disabilities, and volunteer with events/ organizations that provide opportunities for individuals with disabilities. We will teach students on campus what is acceptable in the eyes of the disability community. Housing & Residence Life Awards Distinguished Service Award: Lexy Barnes and Rachel Gilliam The Department of Housing and Residence Life Distinguished Service Awards are designed to recognize distinguished student leadership while serving ETSU and the Department of Housing and Residence Life. Student leaders receiving these awards are recognized for making the difference in and out of their residence halls during their tenure at ETSU. Recipients must have served the ETSU community through multiple student organizations; lived on campus for a three-and-a-half-year period or seven semesters; represented ETSU at one state, regional, or national housing conference; or participated in the Brenda White Wright Emerging Leaders Academy or LeaderShape or served in a significant leadership role with a campus partner. Rising Star Awards: Coty Hefner, Lauren McKenzie, and Connor Klumb The Department of Housing and Residence Life Distinguished Service Awards are designed to recognize distinguished student leadership while serving ETSU and the Department of Housing and Residence Life. Student leaders receiving these awards are recognized for making the difference in and out of their residence halls during their tenure at ETSU. 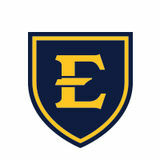 Recipients must have served the ETSU community through multiple student organizations; lived on campus for a three-and-a-half-year period or seven semesters; represented ETSU at one state, regional, or national housing conference; or participated in the Brenda White Wright Emerging Leaders Academy or LeaderShape or served in a significant leadership role with a campus partner. NRHH “Of the Month” Awards National Residence Hall Honorary (NRHH) Beta Upsilon Chi Sigma Chapter Each month, NRHH accepts nominations for awards called “Of The Months” (OTMs). Awards are given out in a multitude of categories and you can nominate as many people as you would like for each month/category. Visit http://otms.nrhh. org to submit nominations for future awards or learn more! We would like to recognize all OTM Winners from March 2018 to February 2019! Adult, Commuter and Transfer Students Awards Tau Sigma National Honor Society Scholarship Recipient: Travis Long Tau Sigma, the national honor society for transfer students, awards scholarships to transfer students who have excelled academically and have been highly involved. These students must be members of the university’s chapter of Tau Sigma Honor Society and have been involved with the chapter, the university and the community. The Outstanding Transfer award recognizes high-achieving and highly engaged transfer students who have taken on leadership roles or have been involved in campus and community life at ETSU. These students are shining examples of making a successful transition to ETSU. In addition, these students have completed at least one semester at ETSU with an ETSU GPA of 3.0 or higher. ACTS Above and Beyond Award: Angela Marson This award is presented to an individual who, in the course of their customary duties, consistently goes “above and beyond the call of duty” in supporting ETSU transfer and adult students. Nominated individuals may be staff or faculty who are felt to have gone “above and beyond” in the performance of their requisite responsibilities. The individual chosen captures the spirit of ETSU and the true objective of the university – that of working to enrich not only a student’s academic excellence, but the personal development of the individual, as well. Preview and Orientation Leader Awards Dr. Melissa Dagley New Orientation Leader of the Year: Akeem Brown This award is given to a first-year orientation leader who has been recognized by peers as the best new leader for 2018. Returning Orientation Leader of the Year: Layne Ellis This award recognizes POLO leaders for a high level of excellence and service in their second year or more of service as a leader. Orientation Leader of the Year: Seth Montgomery This is the highest honor given to orientation leaders, recognizing the best of the best who demonstrate Buccaneer spirit and â&#x20AC;&#x153;can doâ&#x20AC;? attitude. Unstoppable Award: Ethan Baxter This award is given to the POLO leader who best demonstrates commitment to the organization and university through service. Hoot and Holler Award: Mia Veal This award is given to the POLO leader known for encouraging and supporting others with an energetic personality. POLO Above and Beyond Award: Nicholas Shortridge The POLO leader receiving this award always lends a helping hand and exemplifies the high standards of ETSU POLO. New POLO Leader of the Year: Roxy Reed The New POLO Leader of the Year exudes POLO spirit and demonstrates dependability, commitment, and excellence through service in the first year. Returning POLO Leader of the Year: Malineski Russell This award is given to the POLO leader who serves as a mentor and guide to others, exudes spirit and confidence, and is an ideal POLO team member. Dr. Bonnie Burchett Spirit of POLO Award: Anthony Walls This POLO leader exudes spirit and the essence of the POLO organization, and is a person who lives by the emblems on the POLO pin and leads with a servantâ&#x20AC;&#x2122;s heart. Dr. Sally S. Lee Leader of the Year Award: Shaina Wall This award is given to the POLO leader who serves as a mentor and guide to others, exudes spirit and confidence, and is an ideal POLO team member. Gamma Sigma Alpha Academic Excellence Award - Alpha Delta Pi Gamma Sigma Alpha National Academic Greek Honor Society (GSA) is the premier organization committed to the academic success of sorority and fraternity members and alignment with the academic missions of the host institution. Students are eligible for membership based on grade point average and membership in a Greek fraternity or sorority. The society strives to uphold the high ideals of scholastic achievement, and therefore, only students with a cumulative grade point average of 3.5 or above (on a 4.0 scale) at the start of their junior year or a grade point average of 3.5 or higher in any semester during their junior or senior year are eligible. Fraternity & Sorority Leader Awards Outstanding New Member of the Year: Emily Brown, Alpha Delta Pi Each year, ETSU Fraternity and Sorority Life recognizes an up-and-coming new member of the Fraternity and Sorority Community. These individuals have demonstrated outstanding potential for leadership by maintaining high grades while balancing a healthy level of involvement in student organizations and leadership roles with the fraternity or sorority of which they are a part. 2019 Outstanding Fraternity Man of the Year – Chris Bouyer, Sigma Beta chapter of Alpha Phi Alpha Fraternity, Inc. 2019 Outstanding Sorority Woman of the Year – Mandy Nutter, Alpha Delta Pi Two students from the Fraternity and Sorority Community who have exemplified leadership both within the Fraternity & Sorority Community and on the campus at large are recognized each year. These individuals demonstrate the principles and values of brotherhood/sisterhood, service and scholarship. Student Government Association Awards The Tait Obadiah White Award: Nicholas Shortridge This award is named for and in honor of Tait Obadiah White, who attended ETSU from 2011 to 2012. Tait was an outstanding student leader and a member of the Student Government Association who passed away unexpectedly of a rare heart condition in October 2012. Each year since 2013, the Student Government Association has selected from its members an individual who emulates Taitâ&#x20AC;&#x2122;s commitment to servant leadership, someone whose spirit brings happiness to others, someone who gives of themselves, and someone who always helps others through small and simple actions. The award is presented annually and is selected by a vote of all SGA members. Cabinet Member of the Year Award: Blakely Griffin The award is presented annually and is selected by the President. Associate Justice of the Year Award: Seth Manning The award is presented annually and is selected by the Chief Justice. Senator of the Year Award: Scarlett Knott The award is presented annually and is selected by the Executive Vice President. The Ronald & Edith Carrier Student Government Leadership Award • Megha Gupta • Devon Waldroff • Cristopher Santana Dr. Ronald E. Carrier served as President of James Madison University with his wife Edith by his side as First Lady from 1971-1998. Ronald and Edith also served side-by-side years earlier on the Student Government Association at East Tennessee State University. In honor of their experience in student government at the university, Ronald and Edith established this award. The award includes a monetary gift and bronze medal worn on a blue and gold neck ribbon. Dorman Stout Leadership Endowment Scholarship • Noah McGill • Aamir Shaikh Dr. Dorman G. Stout Jr. was an icon of student life at ETSU and an alumnus, having graduated as a part of the class of 1952. Stout was the son of the longtime sociology professor for whom the Stout in Rogers-Stout Hall is named. He served as Director of Financial Aid, Assistant to the Dean, Dean of Students, and then as Vice President of Student Affairs until his retirement in 1996. He created this award to recognize outstanding student leadership. The award criteria denotes that the student to be recognized will be active in leadership within organizations both on campus and within the community at large. The recipient will demonstrate the leadership traits and character of integrity represented by the life and service of Dr. Stout to East Tennessee State and to humankind. Most importantly, as the award goes to a returning ETSU student, it recognizes the potential and the expectation for continued leadership at the University in the years ahead. Omicron Delta Kappa was the first college honor society of a national scope to give recognition and honor for meritorious leadership and service in extracurricular activities and to encourage development of general campus citizenship. At ETSU, OΔK membership serves as the university’s highest individual honor given for campus leadership and involvement. Congratulations to the 2019 OΔK Circle inductees! 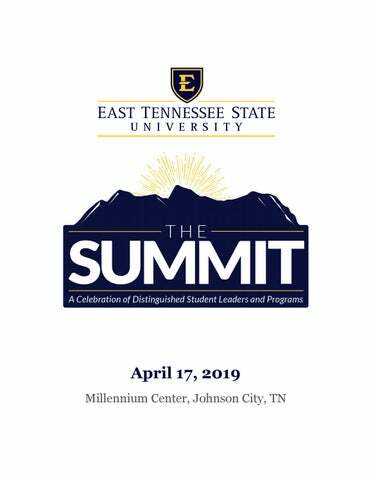 “The Summit: A Celebration of Distinguished Student Leaders and Programs” celebrates the superior accomplishments of students outside the classroom. It recognizes student organization presidents and advisors, community service efforts, campus programs, and outstanding student leaders at East Tennessee State University. Chosen by a committee of students, faculty, and staff, the name of the event — “The Summit” — refers to the attainment of the highest possible level of achievement. It visually invokes an image of the topmost point of a mountain, reaching the pinnacle of success by overcoming many obstacles and challenges along the way. Congratulations to the 2019 Summit Award Recipients!